A map of the suggested stops along two of DC's most popular BikE trails. Torie partridge, illustrator. In and around DC, we are lucky to have bike trails that are easily accessible—a great motivator to get out and get fit while making the most of our city. Make a day of a bicycle ride in DC or the outskirts and you may end up feeling you’ve had a miniature vacation. Two favorites are the Washington and Old Dominion Trail (W&OD) and the Rock Creek Trail. Both are long and winding with varied scenery and have hidden treasures. 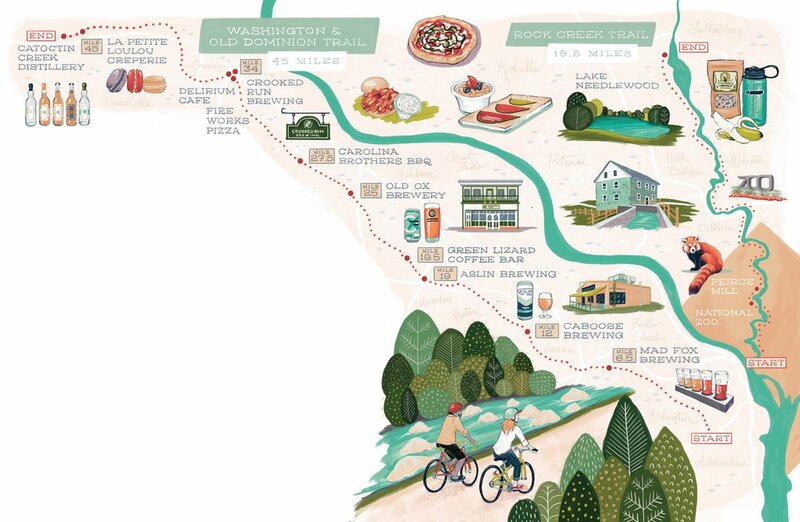 Cyclists looking to make a day of a great bike ride with food and drink will love the W&OD, a 45-mile trail that stretches from Shirlington to Purcellville, Virginia. The trail gets its name from the railroad that operated from 1859 to 1968 on this route, originally built to transport coal and Appalachian riches to Alexandria, but later used as a passenger railway. For riders from the DMV, the trail is easily picked up in Shirlington at the end of the Four Mile Run trail. Riders can also park at different stops along the trail where trail parking is offered by the regional park. Metro access is available along the Orange line at East Falls Church and Dunn Loring and along the Silver line at Wiehle-Reston. The trail “out and back” totals 90 miles. Most choose to ride just a portion of the way, starting either at the beginning in Shirlington, or at any point along the way. No matter where you start, great food and drink await. The DMV offers great trails for cyclists. Part of what makes the W&OD so special is how the surrounding communities have embraced it. Starting in Falls Church, at mile marker 6.5, cyclists have easy access to Mad Fox Brewing Company. Two blocks off the W&OD, Mad Fox Brew Pub offers a full menu of local beers. For riders starting in Shirlington looking to do a shorter ride, Mad Fox is an easily achievable destination. Just west of mile marker 12, in Vienna, is Caboose Brewing Company. Caboose takes full advantage of the W&OD: You’ll see Caboose’s large and inviting patio from the trail. Caboose serves fresh brewed, floral and earthy beers alongside locally sourced farm-to-table dishes. The food and drink coupled with the view of the trail make for a must stop. The stretch from Vienna to Herndon is about seven miles and passes through Reston. Bikers rejoice: Several fabulous establishments back right up to the trail. In Herndon, stop for a beverage at the Green Lizard Coffee Bar. Just beyond mile marker 19.5, the family-owned Green Lizard serves freshly roasted coffee, and to cyclists there is nothing as refreshing as a fresh iced coffee. Beer here too. Taps often feature local beers, but Bell’s Two Hearted Ale is always on tap. Half a mile off the same mile marker (19) is Aslin Brewing Co. in Herndon, a great stop for folks who enjoy big-bodied, fruity beers. Continuing down the trail, cyclists will pass through Sterling and into Ashburn, where they will find Old Ox Brewery just off the trail. Old Ox is a family-run brewery just after mile marker 25, which offers a large variety of beers and a big porch overlooking the trail. On nice days, the large garage doors of the brewery open up to the trail, and guests can enjoy the view and breeze of the W&OD. Try the Hardway Summer Lager, a light golden lager perfect as a thirst quencher on a warm day. Also in Ashburn, at mile marker 27.5, is one of the most popular places to eat: Carolina Brothers BBQ. There aren’t many things that can work up an appetite like a long ride, and with the smell of barbecue starting a quarter mile before Carolina Brothers, you can’t help but stop. From here it’s about five miles to Leesburg, where many cyclists choose to stop for a great bite or drink. The W&OD trail runs directly through downtown Leesburg. Located at mile marker 34, Fire Works Pizza is a fantastic option for food and drinks and is located 1/5 mile from the trail. Three-time winner of Loudoun County’s best pizza title, Fire Works offers wood-fired pizza with local ingredients and has over 100 beers as well as an extensive wine list, including many local ones. The Smokey Blue pizza, featuring Gorgonzola, wood-roasted onions and local bacon is a house favorite. Fire Works has an outdoor patio overlooking downtown Leesburg and with its fresh-fired pizza and extensive local beverage list, this joint serves as a turnaround point for many. Within the Tuscarora Mill complex, check out Crooked Run Brewing. Crooked Run is a brewpub that offers small-batch, fresh-brewed beer with attention to detail and creative takes on well-known styles. Brewers recommend the Carrera Torcida for cyclists, a crisp and refreshing Mexican lager. Have a beer on their patio, and you will be surrounded by elderberry, sour cherry and hops all grown for use in their beers. Worth mentioning is the opening of the first Delirium Café in the United States, also in downtown Leesburg, scheduled for May 15. And if you have energy to ride out to Purcellville’s quaint downtown, the farthest point, you will be rewarded with beautiful scenery on the way to Catoctin Creek Distillery, La Petite LouLou Creperie, BBQ, ice cream and more—all a short distance from the end of the trail. What makes the W&OD trail so special is that it has something for everyone. Riders can choose the length of their ride, and at any point be within minutes of a great place to eat and drink. It’s all about exploring and discovery—have fun. Rock Creek Park in DC offers an equally wonderful trail and is a fantastic option for folks looking to make the most of nature within the city. Unlike the W&OD, which offers just one path, Rock Creek Park is much larger and offers options. The best of Rock Creek is accessible on weekends and holidays, when Beach Drive is closed to vehicles during the day. Cyclists can start at Beach Drive and Broad Branch for another “out and back,” which continues north 19.5 miles, one way. Riders can access the trail from Cleveland Park or Van Ness stops on the Red line. Those who follow the trail to the head of the creek at Lake Needwood will need to do a little route finding, much of which is outlined on the website bikewashington.org. Food and beverage options are sparse on this trail, but nature’s lush surroundings are abundant and you may find yourself in awe of how just how beautiful a park Rock Creek is. For much of the trail, cyclists have the option of biking either on paved road or on the parallel bike path. Getting to Lake Needwood is a treat and re-energizes a cyclist amid a long ride. However, remember to hydrate the proper amount and eat the right food before you leave on this (or any) long ride. Focus on replenishing electrolytes and carbohydrates as key factors, in addition to hydration. Most experienced cyclists recommend breakfast around two hours before your ride, giving enough time to get digestion under way. Oatmeal, or a two- or three-egg omelet is a great way to start the day; fruits and vegetables are good choices too. During the ride, bring snacks that provide electrolytes in addition to hydration and carbohydrates for energy. A banana is a healthy choice for a workout, as is an energy bar. Think about bringing trail mix or a local granola; it’s also fun to make your own. Before, during and after your ride, hydrate. Do not forget to drink water—500ml to a liter per hour is a good pace. Both of these trails offer riders the freedom to pick and choose a distance, a destination and a place to unwind. You’ll see that most riders on either trail are usually smiling as they ride by. We’ll bet that after you embark on your ride, you’ll understand why.